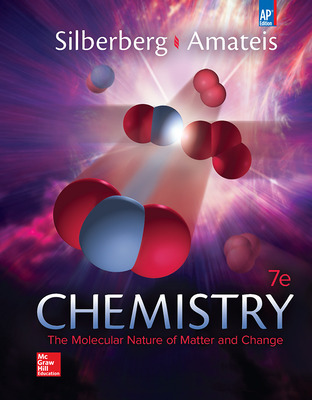 Chemistry: The Molecular Nature of Matter and Change by Martin Silberberg has been recognized in the general chemistry market as an unparalleled classic. The seventh edition keeps pace with the evolution of student learning by adding and significantly enhancing sample problems, a key resource of students. The text still contains unprecedented macroscopic-to-microscopic molecular illustrations, consistent step-by-step worked exercises in every chapter, and an extensive range of end-of-chapter problems, which provide engaging applications covering a wide variety of interests, including engineering, medicine, materials, and environmental studies. Changes have been made to the text and applications throughout to make them more succinct, to the artwork to make it more teachable and modern, and to the design to make it more simplistic and open. Each chapter opener includes a correlation of the chapter sections to the AP Curriculum Framework. The AP Connections section of the chapter openers pinpoint the most important parts of the AP Curriculum addressed in the chapter. The AP Chapter Review at the end of each chapter pinpoints those chapter concepts and skills essential to the AP course. AP supplements including a robust Teacher's Manual and AP Practice Test Booklet are available. McGraw-Hill's Connect® integrated learning platform lets teachers customize and deliver assignments, quizzes, and tests online. The end-of-chapter problems are available in a digital, auto-graded format. Connect also features SmartBook™, the adaptive, interactive eBook powered by LearnSmart™ technology.